Some gamers may pooh-pooh good graphics, but Bethesda's Pete Hines thinks they're integral to immersion. You've probably seen a scene very much like this one message boards and gaming forums all over the place: Gorgeous screenshots from Game X are leaked, but then someone chimes in as a naysayer. "Why do game companies keep wasting time on graphics," they say, "Graphics don't matter at all." Bethesda's VP of marketing Pete Hines thinks those people are full of it. "There's a lot of people who say graphics don't matter," Hines said in the most recent OXM Podcast. "To them I usually say 'you're lying.'" Graphics can make or break whether people are interested in a game, said Hines. "[People] will look at a screenshot and make a snap decision: 'that looks awesome,' or 'I'm not interested.' So if you can make something look amazing just at first glance, it's so much easier to get them." Graphics aren't just a marketing point either, said Hines - they can aid in a sense of immersion in a fictional world. Naturally, he plugged his company's upcoming Elder Scrolls V: Skyrim, saying that Bethesda was "looking for the best sense of immersion you can get." A word of advice, Pete: Mudcrabs aren't very immersive. 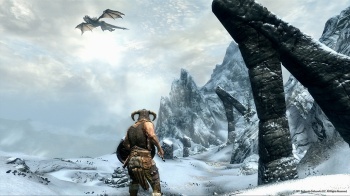 Judging from last month's in-game trailer, Skyrim is rocking the visuals quite nicely.